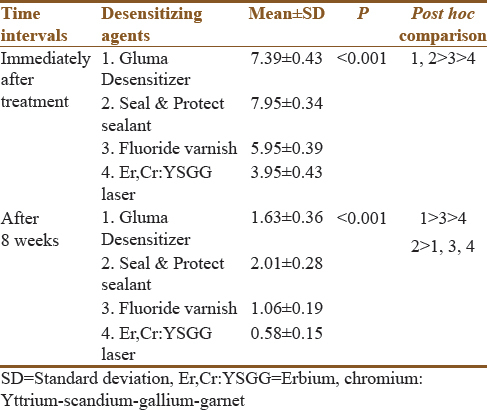 Background and Aim: This study evaluated and compared the immediate and 2-month desensitizing efficacy of Gluma Desensitizer, Seal and Protect sealant, fluoride varnish, and erbium, chromium: yttrium-scandium-gallium-garnet (Er,Cr:YSGG) laser in reducing cervical dentin hypersensitivity (DH). Materials and Methods: Sixty patients each with at least one hypersensitive premolar were selected and randomly assigned to four groups: Gluma Desensitizer, Seal and Protect sealant, Duraphat fluoride varnish, and Er,Cr:YSGG laser. The assessment method used to quantify sensitivity was the cold air syringe, and the sensitivity was recorded by the visual analog scale (VAS), before treatment (baseline), immediately after treatment, and after 1, 2, 3, and 8 weeks. Results: The study results showed that there was a significant reduction in sensitivity at the various time intervals with all the four desensitizing agents – glutaraldehyde in methacrylate resin (Gluma Desensitizer), nanofilled methacrylate resin (Seal and Protect), sodium fluoride varnish (Duraphat), and Er,Cr:YSGG laser therapy. Conclusion: It can be concluded that after 8 weeks of clinical evaluation, all therapies showed lower VAS sensitivity values compared with baseline, independently of their different modes of action. The study indicates that Er,Cr:YSGG laser can emerge as an efficient treatment alternative in the reduction of DH. There are many etiological and predisposing factors related to DH. Most common were the removal of enamel, as a result of attrition, abrasion, and erosion, and the loss of cementum from root surface. Microscopically, the features that determine the degree of DH include the number, diameter, and size of the open dentinal tubules. The number of tubules per unit area is about eight times greater, and the tubular diameter is two times greater in sensitive teeth than in nonsensitive teeth. Various agents have been used in the past to alleviate DH. According to Pashley, products for in-office application are generally classified as those that do not polymerize, such as varnishes and precipitating agents, and those that undergo a setting reaction or polymerizing action, such as the conventional or resin-modified glass ionomer cements and resinous adhesives. Other forms mentioned in the literature are bioglass  and propolis (a mixture of resin, essential oils, and wax, mixed with beeswax, amino acids, minerals, ethanol, Vitamins A, B complex, and E, pollen, and bioflavonoids). Nevertheless, information about the efficiency of these products is scarce. Kimura et al. recommended laser therapy to treat DH. Many studies have demonstrated the effectiveness of neodymium-doped yttrium-aluminum-garnet (Nd: YAG) laser, erbium-doped yttrium-aluminum-garnet (Er: YAG) laser, CO2 laser, and low-level laser therapy in the treatment of DH., Recently, erbium, chromium: yttrium-scandium-gallium-garnet (Er, Cr:YSGG) laser has been reported as an efficient treatment alternative. Unlike previous dental lasers, Er, Cr:YSGG does not fuse/melt the dentinal tubules, which suggests that the mechanism of action for reducing DH is related to the disruption of the electrical impulse of the nerve fibers. Hence, the aim of this single-blind randomized clinical trial was to have a comparative evaluation of the 2-month desensitizing efficacy of the four desensitizing agents: glutaraldehyde in methacrylate resin (Gluma Desensitizer), nanofilled methacrylate resin (Seal and Protect), sodium fluoride varnish (Duraphat), and Er, Cr:YSGG laser by considering the reduction in visual analog scale (VAS) Scores. This study was designed as a single-blind, randomized clinical trial with a concurrent parallel design to compare the clinical outcomes of DH therapy of patients with glutaraldehyde in methacrylate resin, nanofilled methacrylate resin, sodium fluoride varnish, and Er, Cr:YSGG laser application. The study was performed in the Department of Conservative Dentistry and Endodontics of Maulana Azad Institute of Dental Sciences from October 2015 to March 2016. The participants were asked to sign consent form and fill out a medical history questionnaire. The study protocol was approved by the Ethical Committee of Maulana Azad Institute of Dental Sciences, New Delhi. The study included 60 patients (32 females, 28 males) aged 30–40 years of complaining of hypersensitivity. However, equal number of males and females was assigned to each group on a random basis [Table 1]. The sample size was decided on the basis of availability of the patients. The response rate of the patients turned out to be 100%. The mean age of the patients [Table 2] with glutaraldehyde in methacrylate resin was 34.40 ± 3.29, nanofilled methacrylate resin was 36.13 ± 3.04, sodium fluoride varnish was 36.67 ± 3.11, and Er, Cr:YSGG laser application was 34.80 ± 2.73. The participants within 30–40 years of age group who had at least one premolar with sound exposed cervical dentin on the facial surface that gave a VAS score of 10 on application of compressed air. Nonvital teeth or teeth with symptoms of pulp damage or any congenital enamel/dentin defects. These patients were randomly divided into four groups to evaluate different treatment methods for DH. Before the treatment, patient counseling was done on good oral hygiene practices, dietary factors, and risk factors for hypersensitivity as well as root caries. The hypersensitivity reaction was provoked by air blast 1 cm from the cervical region of the tooth surface, after removing supragingival plaque (This stimulus causes a decrease in temperature at the dentine surface and also fluid evaporation from opened dentinal tubules that activate the hydrodynamic forces at the dentinal tubules and stimulate the painful sensation, i.e., a combination of thermal and evaporative stimuli). The stimulus was delivered on all 60 teeth until reaction or up to maximum of 10 s.
The patients were asked to rate their degree of hypersensitivity on a 10-cm VAS as suggested by Plagmann et al. The left endpoint designated no pain was marked as 0 and the right endpoint designated worst pain was marked as 10. To standardize the samples, the criterion for inclusion in the study was a sensitive response of grade 10, in the 0–10 numeric scale for pain evaluation. A few drops of Gluma Desensitizer (Heraeus Kulzer, Armonk, NY, USA) were applied with a cotton pellet using a gentle but firm rubbing motion. After 30 s, the area was dried thoroughly until the fluid disappeared and the surface was not shiny. A few drops of Seal and Protect (Dentsply DeTrey, Konstanz, Germany) were applied to the dentin surface with an applicator tip. The surface was left undisturbed for 20 s, and the acetone solvent removed by gently airing for a few seconds and light cured for 10 s. The oxygen-inhibited layer was removed with a cotton pellet and the excess checked with a periodontal probe. Duraphat (5% sodium fluoride varnish) (Colgate Oral Pharmaceuticals, NY, USA) was applied by the use of a brush and the patients were instructed not to eat hard foods or brush for at least 2 hours after the application. Er, Cr:YSGG laser (C100 Model, WaterLase co, WaterLase MD™, USA) (2780 nm wavelength) was used at lower power settings (0.25 W) with little air and water spray. The effectiveness of the therapies was assessed by recording the posttreatment VAS scores at the four examination periods: immediately after the application of the desensitizing agent (i.e., after 2 h) and after 2 months. The first assessment was performed at 2 h after the application for which the patients waited in the hospital. The second evaluation was done at the designated interval. The statistical analysis was done using the software Statistical Package for the Social Sciences version 17 for Windows (Epi Info™ Version 3.5.3). The mean VAS score for the measurement of DH among the various desensitizers was compared using the analysis of variance (ANOVA) and Bonferroni post hoc test was used for the comparison between the various groups at the various time intervals. The level of significance was kept at 5% (confidence level 95%). The normality testing was performed on the data by checking the VAS scores at 2 months of the four desensitizers. The mean VAS scores for Gluma Desensitizer, Seal and Protect, fluoride varnish (Duraphat) and Er, Cr:YSGG laser therapy desensitizers at the two time intervals [Table 3] were compared using the one-way ANOVA test, and there was a significant difference between the various desensitizers at the interval of 8 weeks (P< 0.001). 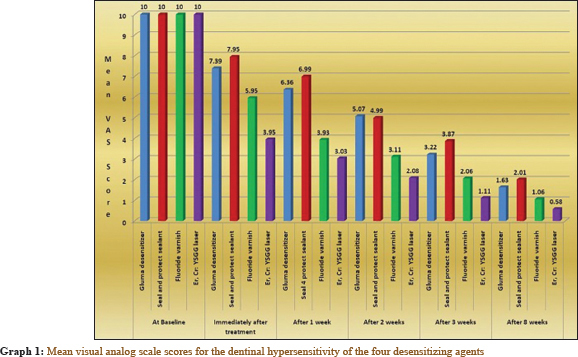 [Graph 1] shows the mean visual analog scale scores for the dentinal hypersensitivity of the four desensitizing agents immediately after treatment, after 1, 2 and 8 weeks. Further, within the groups, difference using the Bonferroni post hoc comparison test showed that fluoride varnish and Er, Cr:YSGG laser were found to produce a significantly more decrease (P < 0.05) in the mean VAS score for the degree of hypersensitivity in comparison to the Gluma Desensitizer and Seal and Protect sealant immediately after treatment (after 2 h) and 8 weeks after the treatment. Er, Cr:YSGG laser was found to have a significantly more decrease (P< 0.001) in comparison to the fluoride varnish. Over the decades, various desensitizing agents have been clinically tested endeavoring to reduce discomfort from cervical DH. The results have been widely variable and, to some extent inconclusive, due to the different methodologies employed, variability of the subjective response, and the influence of a placebo effect. It has been suggested that the ideal desensitizer should (1) not unduly irritate the pulp, (2) be painless when applied, (3) easy to apply, (4) consistently effective, (5) permanently effective, (6) quick acting, and finally (7) not cause tooth discoloration. Although most of the current methods used fall short of these criteria, the application of desensitizing agents is still strongly recommended because it is a noninvasive treatment. Nowadays, two main methods are used in the treatment of DH: tubular occlusion and blockage of nerve activity by means of direct ionic diffusion, increasing the concentration of potassium ions acting on the pulpal nerve sensorial activity. Among the substances indicated for occlusive therapy are the oxalate, chloride, and fluoride-based agents, either associated with iontophoresis, or not. When there is no loss of dental structure, dentinal adhesives in the form of bonding agents and varnishes can be indicated. They produce an immediate effect, but they are easily removed. As these topical desensitizing agents do not adhere to the dentin, their effects are temporary. Moreover, available evidence currently does not support the treatment with oxalates. Some authors have shown that calcium silicate cement derived from Portland cement can help in the management of DH. It helps to occlude the dentinal tubules by remineralization. Similarly, it has been proposed by the manufacturers that Casein phosphopeptide–amorphous calcium phosphate (CCP-ACP) may be used to treat DH, by virtue of its remineralizing capacity. It has been found that Er, Cr:YSGG and diode lasers achieve the desensitizing effect by suppressing the evocated potential of the pulp nociceptive nerve fibers. The laser interaction with the dental pulp causes photobiomodulating effect, increasing the cellular metabolic activity of the odontoblasts, and obliterating the dentinal tubules with the intensification of tertiary dentine production. A systematic review of the literature indicates the likelihood that laser therapy has a slight clinical advantage over topical medicaments in the treatment of dentine hypersensitivity. Various laser types have been tested for DH treatment, including Nd: YAG and Er: YAG, CO2, He-Ne, and diode (i.e. GaAlAs) lasers, with various energy settings and with wavelengths (l) ranging from 632.8 nm (He-Ne) to 10,600 nm (Er: YAG, CO2). Eversole et al. reported that no pulpal inflammatory responses could be identified in Er, Cr:YSGG laser irradiated teeth with a water spray. On the contrary, literature suggests lack of research regarding the use of Er, Cr:YSGG laser for the treatment of hypersensitivity. Pain associated with DH is difficult to quantify and reproduce. The VAS has been reported as reliable in the literature for pain assessment. The sealing of dentinal tubules with resins and adhesives has been advocated for many years as a means of managing DH. In general, results have been good, but problems arise when the adhesive breaks away resulting in exposure of the tubule. The Gluma Desensitizer product contains 5% glutaraldehyde and 35% hydroxyethyl methacrylate. It is hypothesized that glutaraldehyde acts on the proteins of the dentinal fluid for the immediate occlusion of the dentin tubules. In the reaction of glutaraldehyde with dentin, the two groups of aldehydes present in glutaraldehyde interlace themselves with the amino groups of dentin collagen, leading to a fixing of proteins, forming a barrier. The desensitizing agent Seal and Protect showed similar results to those shown by Gluma. The agent Seal and Protect is derived from the adhesive system Prime and Bond NT that has an antimicrobial characteristic, resulting from the incorporation of triclosan and acid monomers, which are self-conditioning. It has been proved that Seal and Protect protective sealant blocks dentinal tubules and provides desensitization for up to 6 months and can then be reapplied. Topical fluorides create a barrier by precipitating CaF2 at the exposed dentin surface, reducing dentin permeability and consequently DH. Duraphat covers even moist teeth with a film of varnish for several hours with obturation of openings of dentinal tubules. The natural resins contained in fluoride varnishes provide an additional barrier effect, but the concern with topical fluorides is the lack of clinical data regarding longevity of the desensitizing effect. Laser therapy has emerged as an effective tool for the treatment of cervical hypersensitivity because it is painless, safe, fast, conservative treatment and it is well accepted by the patients. The first laser use for the treatment of DH was reported by Matsumoto et al. using Nd:YAG laser. Since then, a large variety of lasers have been used successfully to treat DH. The effectiveness of DH treatment with diode laser, with different wavelengths, has been reported in various clinical studies. Matsumoto et al. found 85% improvement indexes in teeth treated with laser; Aun et al. reported successful treatment in laser irradiated teeth in 98% of the cases; Yamaguchi et al. reported effective improvement index of 60% in the group treated with laser and only 22.2% in the control group; Kumazaki et al. showed an improvement of 69.2% in the group treated with laser compared to 20% in the placebo group. All therapies studied in the present study showed lower VAS sensitivity values compared with baseline, independently of their different modes of action. Furthermore, significant reduction in sensitivity at the various time intervals was reported with the Gluma Desensitizer, Seal and Protect, fluoride varnish (Duraphat), and Er, Cr:YSGG laser therapy, with maximum reduction in VAS scores achieved in the laser group. Beecher  and Morris et al. cited a placebo effect in pain-reducing studies that used placebo controls. Despite the fact that we did not use a placebo in this study, a similar effect could be expected. According to this theory, subjects enrolled in a study might experience a reduction in sensitivity even if their treatment product contained no active ingredient. However, the present study had several limitations. First, only patients with the maximum score of DH were taken and the worsening effect by treatment could not be evaluated as all the patients had score 10 in the beginning and this would give only “positive” response. Hence, negative response or worsening effect due to treatment could not be evaluated. Second, the lack of a placebo-control group limits the interpretation of the results. A placebo-control group might have enabled us to determine more clearly whether any of the results obtained were due to a placebo effect. Finally, the follow-up time was not as long as differences in the results might occur over a longer period of follow-up. Moreover, the fluoride group tested after 2 h might influence accurate hypersensitivity scores due to the physical presence of the varnish. Further, more studies with increased sample size are anticipated to further corroborate the results of this in vivo experiment. The study evaluated and compared the efficacy of Er, Cr:YSGG laser with the three most commonly used desensitizing agents (Gluma Desensitizer, Seal and Protect sealant, and fluoride varnish) for the management of DH. Although there was a significant reduction in hypersensitivity reaction with all the four desensitizing agents, the laser group proved to be superior to others in terms of reduction in hypersensitivity scores. Addy M. Etiology and clinical implications of dentine hypersensitivity. Dent Clin North Am 1990;34:503-14. Collaert B, Fischer C. Dentine hypersensitivity: A review. Endod Dent Traumatol 1991;7:145-52. Pashley DH. Potential treatment modalities for dentine hypersensitivity: In-office products. In: Addy M, Embery G, Edgar WM, Orchardson R, editors. Tooth Wear and Sensitivity: Clinical Advances in Restorative Dentistry. London: Martin Dunitz; 2000. p.351-65. Forsback AP, Areva S, Salonen JI. Mineralization of dentin induced by treatment with bioactive glass S53P4 in vitro. Acta Odontol Scand 2004;62:14-20. Mahmoud AS, Almas K, Dahlan AA. The effect of propolis on dentinal hypersensitivity and level of satisfaction among patients from a university hospital Riyadh, Saudi Arabia. Indian J Dent Res 1999;10:130-7. Kimura Y, Wilder-Smith P, Yonaga K, Matsumoto K. Treatment of dentine hypersensitivity by lasers: A review. J Clin Periodontol 2000;27:715-21. Schwarz F, Arweiler N, Georg T, Reich E. Desensitizing effects of an Er: YAG laser on hypersensitive dentine. J Clin Periodontol 2002;29:211-5. Corona SA, Nascimento TN, Catirse AB, Lizarelli RF, Dinelli W, Palma-Dibb RG, et al. Clinical evaluation of low-level laser therapy and fluoride varnish for treating cervical dentinal hypersensitivity. J Oral Rehabil 2003;30:1183-9. Browdy D. The utility of the fourth-generation ErCr:YSGG all – Tissue laser for modern endodontics. PPAD Endod Ther 2005;5:22-4. Plagmann HC, König J, Bernimoulin JP, Rudhart AC, Deschner J. A clinical study comparing two high-fluoride dentifrices for the treatment of dentinal hypersensitivity. Quintessence Int 1997;28:403-8. Aranha AC, Pimenta LA, Marchi GM. Clinical evaluation of desensitizing treatments for cervical dentin hypersensitivity. Braz Oral Res 2009;23:333-9. Porto IC, Andrade AK, Montes MA. Diagnosis and treatment of dentinal hypersensitivity. J Oral Sci 2009;51:323-32. Ladalardo TC, Pinheiro A, Campos RA, Brugnera Júnior A, Zanin F, Albernaz PL, et al. Laser therapy in the treatment of dentine hypersensitivity. Braz Dent J 2004;15:144-50. Ling TY, Gillam DG. The effectiveness of desensitizing agents for the treatment of cervical dentine sensitivity (CDS) – A review. J West Soc Periodontol Periodontal Abstr 1996;44:5-12. Duran I, Sengun A. The long-term effectiveness of five current desensitizing products on cervical dentine sensitivity. J Oral Rehabil 2004;31:351-6. Cunha-Cruz J, Stout JR, Heaton LJ, Wataha JC; Northwest PRECEDENT. Dentin hypersensitivity and oxalates: A systematic review. J Dent Res 2011;90:304-10. Orchardson R, Gillam DG. Managing dentin hypersensitivity. J Am Dent Assoc 2006;137:990-8. Cai F, Shen P, Morgan MV, Reynolds EC. Remineralization of enamel subsurface lesions in situ by sugar-free lozenges containing casein phosphopeptide-amorphous calcium phosphate. Aust Dent J 2003;48:240-3. He S, Wang Y, Li X, Hu D. Effectiveness of laser therapy and topical desensitising agents in treating dentine hypersensitivity: A systematic review. J Oral Rehabil 2011;38:348-58. Eversole LR, Rizoiu IM. Preliminary investigations on the utility of an erbium, chromium YSGG laser. J Calif Dent Assoc 1995;23:41-7. Ide M, Wilson RF, Ashley FP. The reproducibility of methods of assessment for cervical dentine hypersensitivity. J Clin Periodontol 2001;28:16-22. Walline BW, Wagner JG, Marx DB, Reinhardt RA. Comparison of methods for measuring root and mucogingival sensitivity. Oral Surg Oral Med Oral Pathol Oral Radiol Endod 2000;90:641-6. Bartold PM. Dentinal hypersensitivity: A review. Aust Dent J 2006;51:212-8. Schüpbach P, Lutz F, Finger WJ. Closing of dentinal tubules by gluma Desensitizer. Eur J Oral Sci 1997;105:414-21. Pamir T, Dalgar H, Onal B. Clinical evaluation of three desensitizing agents in relieving dentin hypersensitivity. Oper Dent 2007;32:544-8. Gangarosa LP Sr. Current strategies for dentist-applied treatment in the management of hypersensitive dentine. Arch Oral Biol 1994;39 (Suppl):101S-6S. Matsumoto K, Tomonari H, Wakabayashi H. Study on the treatment of hypersensitive dentine by laser. J Conservat Dent 1985;28:1366-71. Aun CA, Brugnera Júnior A, Villa RG. Raio laser – Hipersensibilidade dentinária. Rev APCD 1989;43:65-8. Yamaguchi M, Ito M, Miwata T, Horiba N, Matsumoto T, Nakamura H, et al. Clinical study on the treatment of hypersensitive dentin by GaAlAs laser diode using the double blind test. Aichi Gakuin Daigaku Shigakkai Shi 1990;28:703-7. Kumazaki M, Zennyu K, Inoue M, Fujii B. Clinical evaluation of GaAl as semiconductor laser in the treatment of hypersensitive dentin. Jpn J Conserv Dent 1990;33:911-8. Beecher HK. The powerful placebo. J Am Med Assoc 1955;159:1602-6. Morris MF, Davis RD, Richardson BW. Clinical efficacy of two dentin desensitizing agents. Am J Dent 1999;12:72-6.